It's been said that heating your house with wood warms you three times; once when you cut the tree, once when you split and stack the firewood, and again when you burn it. As we get older it's something that we always try and avoid; that heavy labor of splitting and stacking the firewood in the woodshed. It's hard work! Those densely grown trees that we have on the property are heavy and cumbersome to drag around, even when they're dry. Douglas Fir, along with most other hard woods, have a lot of weight to them. In clearing parts of our property to give the undergrowth some light (and encourage the bird population) we've got decked trees waiting for either the sawmill, or to be cut up for firewood. It's important to take this action before they've been there too long. In this climate, it only takes a year or two and they start to rot, even if they're up off the ground. If we get really inspired in July, this is a good time to get some firewood in. However, generally, we're lucky to get around to it before September, which is actually a really nice time of year to do it. The days are warm, and there are very few bugs. When you have to wear safety gear using a chainsaw to buck up the lengths, it's best to have cooler weather. Once the trees are cut into 16" pieces, which is the recommended length for our woodstove, they are loaded into the pick up truck, and brought to the woodshed. 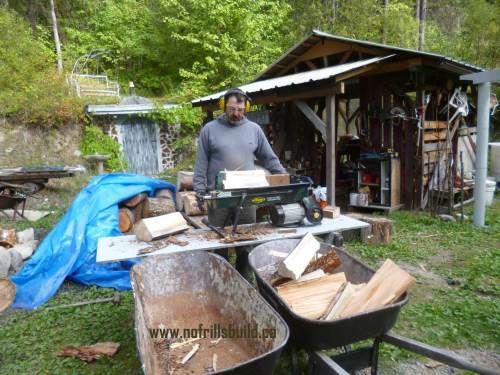 Most times, we try to get all the wood split and stacked in the shed. That's a lot of work if you have a couple of pick up loads to do. Splitting is hard work with a maul or axe. So, we're very grateful to our neighbor for the loan of their electric log splitter. This gadget saves a lot of wear and tear on already aging bones, and gets a good shedful of wood in short order. Here it is in action, with two wheelbarrows standing by. Filling one gives me enough time to stack that, while the other one is being filled. We liked it so much that we eventually bought our own - I hate when you borrow something and it breaks, meaning you have to replace it. 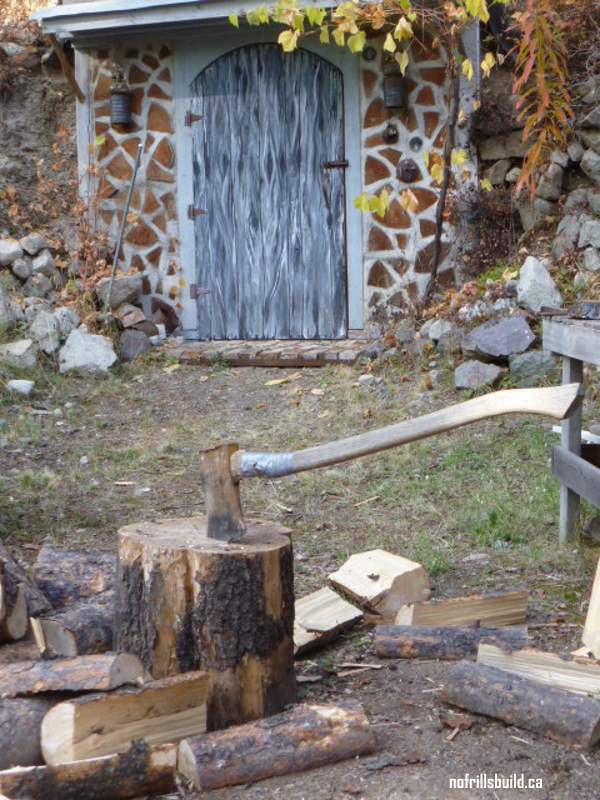 Here are some of our favorite tools for splitting wood. You need to buy at least a few things, just to make it easier - it's hard work after all, and the right tool makes it go a whole lot easier! First of all, a splitting maul helps break into those knotty pieces, chopping them into more manageable chunks. Don't like hard work? 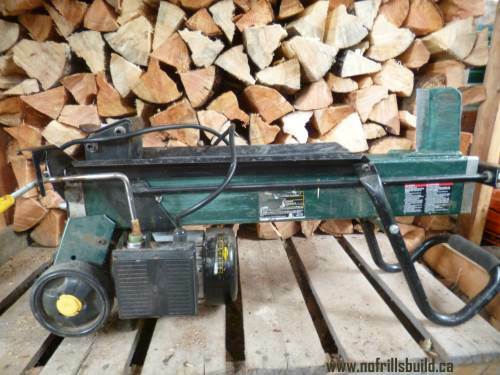 Then do what we did and get a electric log splitter to do the heavy stuff for you! Then, an axe takes them down to burnable size. To cut kindling, you can do it with a larger axe, but it's so much easier to have a designated hatchet for ease of use, and less wear and tear on your wrist. 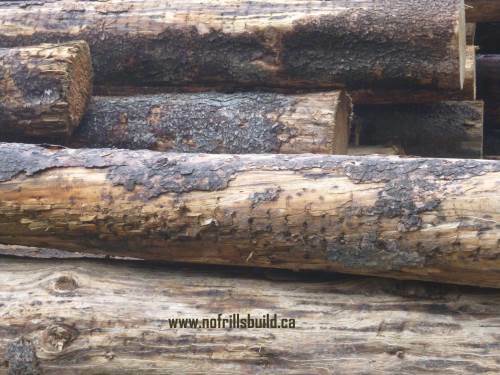 Does your firewood stack up?